Most people think it started with Power Rangers. A giant alien monster appears and threatens the city, only to be stopped by a crack team of specialists wielding advanced powers and weaponry. But no, a year and a half before the chromatically-ambitious teens would grace Western television, Ultraman: Towards the Future would bring sentai goodness to the small screen. The Ultraman franchise dates back to the mid-1960s when the original Ultraman Tv series would air in the wake of the Godzilla and Gamera franchises’ rise to popularity. Each Ultraman series focuses on a member of the ‘Ultra Family’ merging with a local human as they try to defeat the source of the monsters that are attacking each week. The Ultramen are almost without exception morally upstanding, as well as potent fighters, capable of firing energy and other feats of martial super heroics. In Towards the Future (called Ultraman Great in Japan), Ultraman is engaged in battle with his archness is Goudes when he inadvertently allows for the destruction of a human space vessel, killing Stanley Haggard and stranding Jack Shindo. 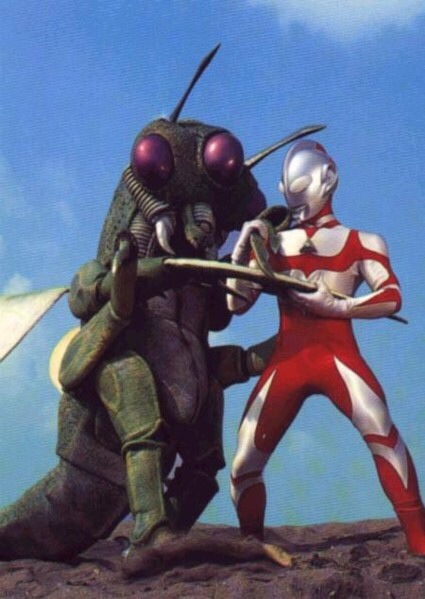 Ultraman bonds with the surviving astronaut and, an undefined time later, they appear on Earth to try and combat the evil Goudes virus that has infected the planet. The setup of Ultraman, at least when viewed on its own merits and not part of the larger franchise, has very little exposition. It’s never explained where Ultraman comes from, where Goudes comes from, or why they’re fighting. The individual episodes can also be a little hit-and-miss. ‘A Child’s Dream’ focuses on a supporting character’s relationship with an orphan…for no real given reason and no explanation ever really offered. Meanwhile, ‘Bitter Harvest’ has a really fascinating build-up to the appearance of the monster, as well as some ecological commentary that’s surprisingly profound. Like most shows, the early episodes were a little rocky, but letter episodes showed some real promise. The supporting cast of the show are given an episode or two each to start to develop their characters. ‘Tourists from the Stars’ shows the show’s resident nerd falling in love, while ‘Forest Guardian’ shows the political games that the military tries to play on our protagonists. There really are no truly outstanding characters or characterizations, but they do a good job with what they have. Much like the characters, the acting in the show isn’t great but it’s okay. Above-average in places, but otherwise just middle of the road. There are a few notable performances, namely when the Goudes story arc comes to an end (‘Blast from the Past’ and ‘Showdown’) and the series finale (‘Age of Plagues’ and ‘Nemesis’). Adequate is really about the best praise this show’s visuals can be given. The monsters are kind of neat-looking but Ultraman himself looks a little cheap. The props look pretty good but the sets often seem a little lackluster. All in all, it all balances out to adequacy. The music is adequate, much like the visuals, but is absent enough so as to not really suffice. The Ultraman theme itself is beautifully done, but the rest of the music is a little trite and sparely played throughout the show. It’s not bad, simply a little lacking. Ultraman: Towards the Future is a solid show, one that errs a little on the cheap side but still delivers all it promises. Sure the production value could be higher and the action sequences could be a little more ambitious, but all in all, the show really is a nice middle-of-the-road production. Fans of the middle years of Dr Who (like the 6th and 7th Doctors) might especially enjoy this series, as would any fan of sentai and kaiju alike.